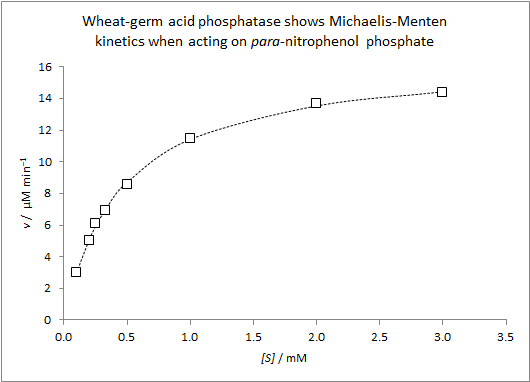 Wheat-germ acid phosphatase shows Michaelis-Menten kinetics when acting on para-nitrophenol phosphate, with a vmax of about 17 µM min−1 and a KM of about 0.5 mM. However, the Michaelis-Menten model relies on a number of assumptions. During the Veneration and Memorisation of the Derivation, these assumptions may be dashed past by the lecturer doing the mathturbation, and may be ignored by the students trying to grasp the point of the modelling. This is problematic, as not understanding the assumptions leads to the Michaelis-Menten being applied thoughtlessly in situations in which it does not apply. Which turns out to be almost all situations. The only relevant chemical species in the system are the enzyme (E), the substrate (S), the enzyme-substrate complex (ES‡), and the product (P). The only relevant chemical reactions occurring in the system are the reversible association of enzyme and substrate to form the enzyme-substrate complex; and the irreversible breakdown of the enzyme-substrate complex to product. The concentration of the enzyme-substrate complex is constant. For the Michaelis-Menten model to be applicable to an enzyme in a cell, then these assumptions need to hold. Are the only chemicals in a cell E, S, P and ES‡? The answer is obviously no. Cells contain thousands of metabolites. To imagine that none of them have any relevant effect on the enzyme under consideration is patent nonsense, particularly when half of the rest of the enzymology course is about enzyme inhibitors, and enzyme regulation by small molecules. Are enzyme-catalysed reactions in the cell irreversible? …all but three of the glycolytic reactions (those shown with a → rather than a ⇄) are usually close to equilibrium in the cell. At equilibrium, the forward and reverse rates of reaction are equal, so for these enzymes, the Michaelis-Menten model is inappropriate because assumption #2 is completely broken. The backwards reaction is appreciable because the concentration of product is relatively high. So for many enzymes in the cell, the answer to the question above is a resounding “no”. You can model these enzymes with a (substantially more complex) reversible version of Michaelis-Menten model, but at, or close to, equilibrium, these enzymes are most assuredly not causing products to accumulate in the way implied by a naïve glance at the graph above. Enzymes acting on near-equilibrium reactions are also exquisitely sensitive to changes in substrate and product concentrations. This is something else that is not obvious from the Michaelis-Menten graph, but which is vitally important, as we shall see below. 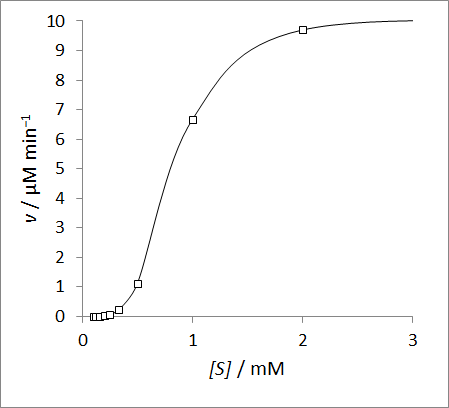 In a test-tube, we can provide a super-duper pristine environment of just E and S, which will give us more-or-less Michaelis-Menten kinetics after a little while (once the concentration of ES‡ has settled down) and then for a little while (until P accumulates a bit and the reverse reaction becomes appreciable), but this is even less realistic than the four-ingredient tube above! What of the remaining three reactions of glycolysis? It turns out these enzymes have to violate the assumptions of the Michaelis-Menten model, and for a very good reason. 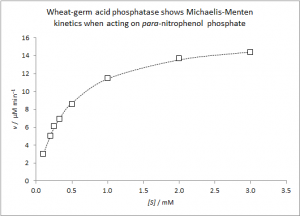 If enzymes that catalyse irreversible reactions in the cell were to exhibit Michaelis-Menten kinetics, what would their response to substrate look like at low substrate concentrations? To double the velocity of such a reaction, you need to double the concentration of substrate: if you look at the graph above, you can see it’s more-or-less a straight line between 0 and 0.5 mM. Requiring the concentration of a chemical to double in order to get an appreciable increase in the rate of the reaction that consumes that chemical is often an extremely bad idea. Your blood normally contains glucose at a concentration between 4 and 6 mM. If your blood glucose needs to double to 10 mM before the enzymes in your body begin to deal with it properly, then you are probably diabetic. These enzymes are usually multimeric and can co-operatively bind multiple substrate molecules, so there are ES‡, ESS‡, ESSS‡, etc., complexes in the system too. They are also often sensitive to feedback inhibition from other small molecules, so there are plenty of other relevant chemicals you need to take account of when modelling their behaviour. These enzymes violate assumption #1 in the most thorough fashion, and have a sharp sigmoidal (S-shaped) response to substrate. The Michaelis-Menten is a very good model of the activity of many enzymes in a test tube full of substrate. Its parameters vmax and KM are genuinely useful bits of basic information to obtain about an enzyme, and they are easy to estimate in this simple system. However, Michaelis-Menten kinetics are inapplicable for most enzymes within a cell because most enzymes act on reactions that are close to equilibrium, and they are unsuitable for most of the other enzymes within a cell, because enzymes acting at far-from equilibrium reactions cannot afford to behave in such a lackadaisical fashion. Be really careful when applying toy models to real cells. Be really careful that you know the assumptions of any model you are using. Really wonderful explanation. As a first year biologist myself, I was quite disappointed when we got through the Michaelis-Menten lab only to find that it was inapplicable in “most” circumstances — excellent to find out exactly which, why, and how. Thank you! Cheers! Although just because it’s not directly applicable, doesn’t mean it’s not useful 🙂 The ‘forward’ Km and kcat values you’d get from a S-and-no-P assay are still needed if you want to model the behaviour under equilibrium conditions; you just need a set of ‘backwards’ parameters too, from P-and-no-S assays too. Sitting here forcing myself to venerate and memorize the Michaelis-Menten approach for the MCAT, and simultaneously spitting nails because it is clear that the whole approach has assumptions that prevent the expression from having any utility in the real world…. I wouldn’t go so far as to say it has no applications in the real world. It’s a really useful model for understanding enzymes in test tubes (which is a very small part of the real world), and it can be extended or replaced with similar kinds of model for enzymes in cells. I don’t object to teaching the MMM, or even going through the derivation (maths is good for the soul); it’s just there needs to be a focus on the assumptions, and on the general principles of modelling, rather than on rote memorisation of the steps of the derivation. Little nitpick for you- I would be careful about saying these reactions are AT equilibrium in the cell. When a reaction is at equilibrium, it effectively does not proceed in either direction, regardless of whether or not an enzyme is present. Enzymes do not alter a reaction’s equilibrium, just the rate at which equilibrium is achieved. They may be NEAR equilibrium in the cell, but really there’s almost always flux going on in one direction or the other- as one enzyme catalyzes the formation of a metabolite, the next enzyme in the pathway consumes the new metabolite, keeping the concentration roughly constant but not quite at equilibrium. Otherwise the pathways and the organism in question would die. Fair point, and apologies for not getting round to replying sooner. I’ve modified the post to make this clearer now.